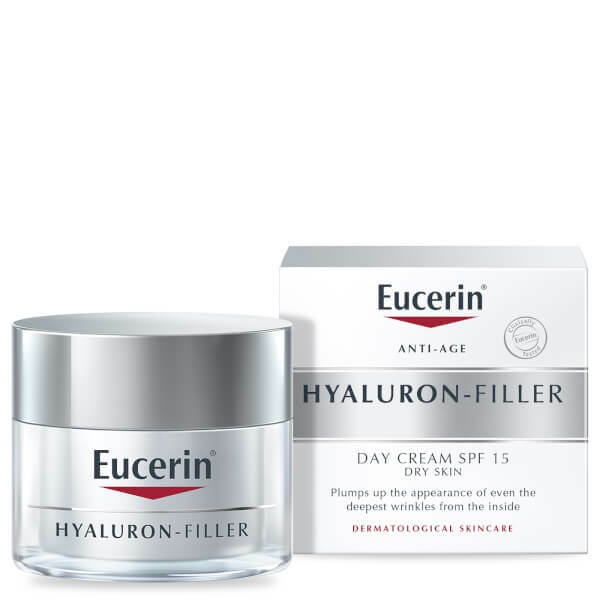 Recapture and maintain youthful skin with Eucerin® Anti-Age Hyaluron-Filler Day Cream for Dry Skin SPF15 + UVA Protection, a dermatologically tested anti-ageing formula that works to plump out the appearance of sagging skin and help prevent premature ageing with UVB and UVA filter protection. 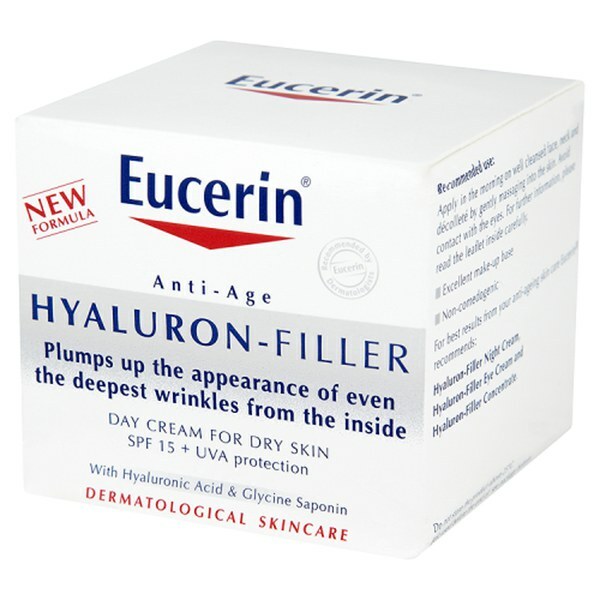 As skin ages, levels of naturally occurring Hyaluronic Acid deplete, causing wrinkles and surface lines to form. To help combat this, the advanced day cream is fortified with a synergy of high and low Hyaluronic Acid and Bio-Active Glycine Saponin (a component that supports the skin's own Hyaluronic Acid) to effectively plump out the look of wrinkles from the inside out, leaving you with smoother, younger-looking skin. Helping to improve moisture retention levels on dry skin, the innovative blend will save you from signs of premature ageing and combat the look of even the deepest of wrinkles. Doubles as an excellent makeup base. Apply in the morning onto the face, neck and décolleté by gently massaging into skin, avoiding the delicate eye area. Aqua, Glycerin, Butyl Methoxydibenzoylmethane, Ethylhexyl Salicylate, Octocrylene, Butylene Glycol, Glyceryl Stearate Citrate, Hydrogenated Coco-Glycerides, Butyrospermum Parkii Butter, Dimethicone, Methylpropanediol, Stearyl Alcohol, Cetyl Alcohol, Glycine Soja Germ Extract, Sodium Hyaluronate, Mica, Silica, Acrylates/C10-30 Alkyl Acrylate Crosspolymer, Carbomer, Trisodium EDTA, 1,2-Hexanediol, Phenoxyethanol, Parfum, BHT, CI 77891.